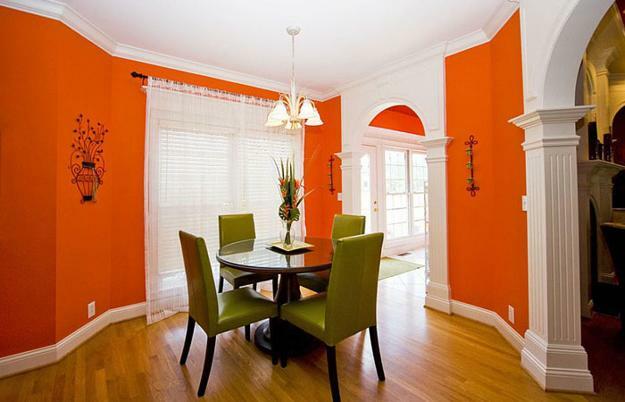 Orange paint colors and orange wallpaper designs are beautiful, warm and cheerful dining room decorating ideas. 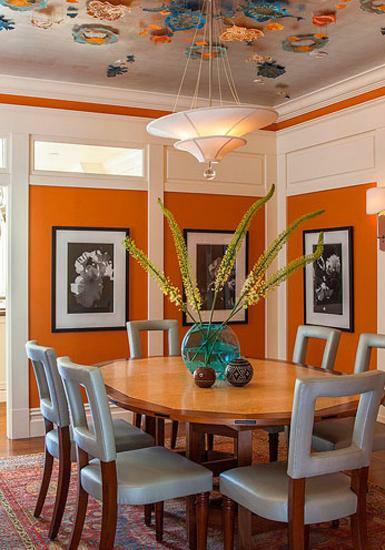 Even if you think that orange colors are not perfect choices for other home interiors, you cannot argue that they offer the best wall paint colors and accent colors for dining room decorating. 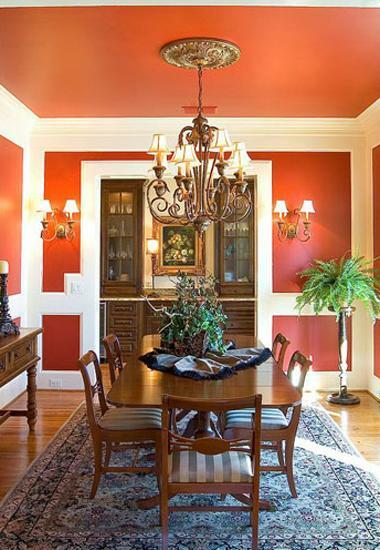 Lushome presents a collection of bold and beautiful dining room decorating ideas to prove it. Orange paint and wallpaper patterns are optimistic and vibrant. 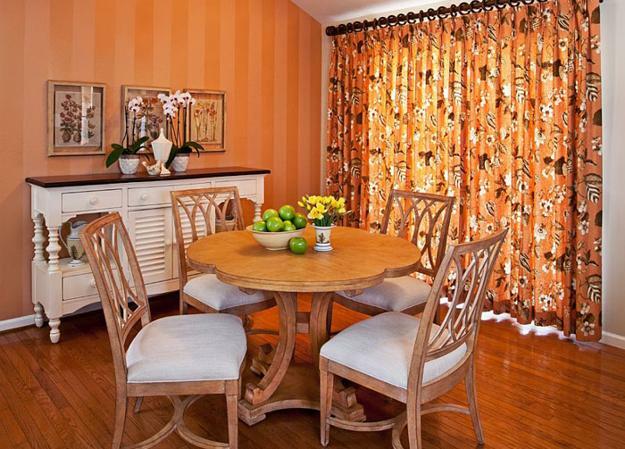 Orange color can be too warm for kitchen design but is perfect for attractive, happy and bright dining rooms. 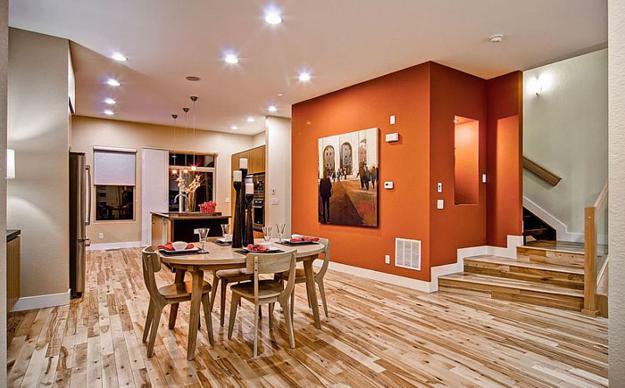 Orange colors are suitable for splendid walls and brilliant ceiling designs. 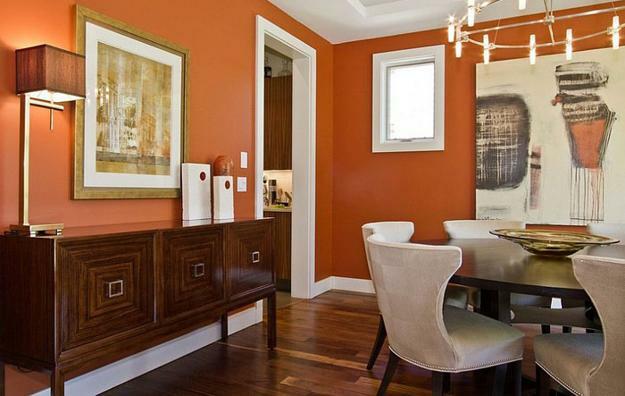 Orange adds bold and energizing accents to neutral color schemes and balances cool dining room colors. 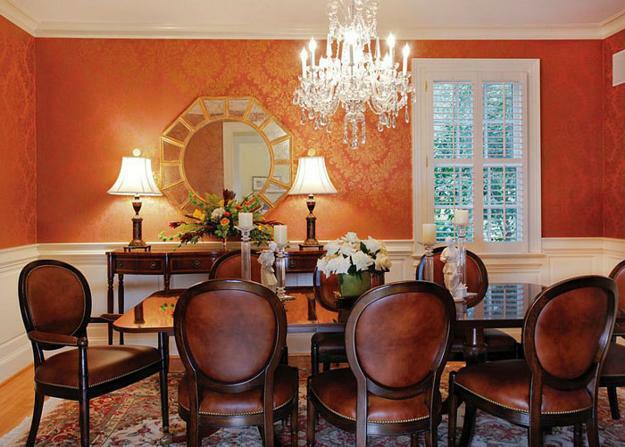 Orange paint and wallpaper are unusual color design choices, but they reflect the latest trends in decorating and offer great options for brave and warm decoration with vibrant interior colors. While bringing a festive mood, orange shades give dining rooms an exclusive, glorious and stylish look and a festive feel. 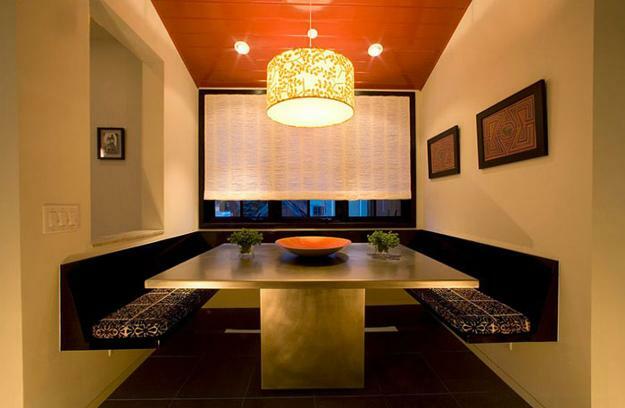 After warming up interiors with wooden furniture, orange shades show off their intense and powerful nature and create comfortable and beautiful dining rooms. Ignoring orange designs, seeing something different is impossible. 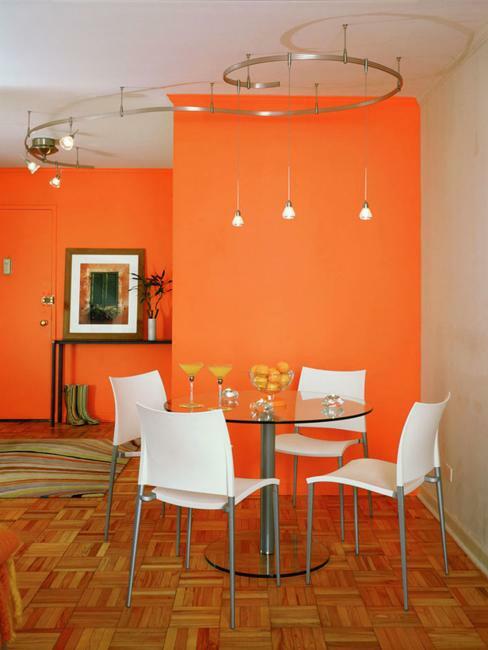 Orange walls are eye-catching, stimulating and cozy. 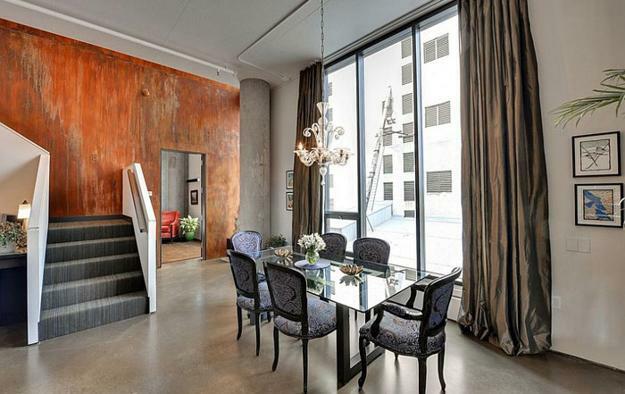 Orange paint colors and orange wallpaper patterns are two fantastic options to add a stunning look to wall decoration and create spectacular, bright and colorful ceiling designs that make a statement. 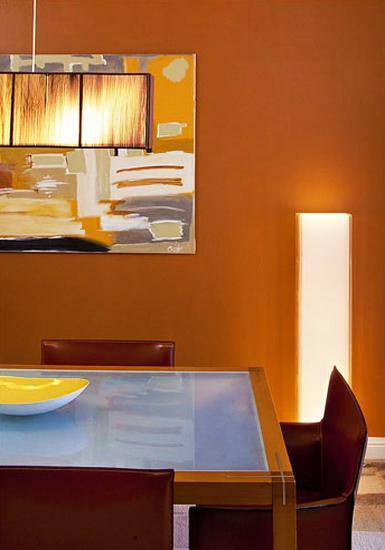 Orange creates vibrant and warm color combinations. 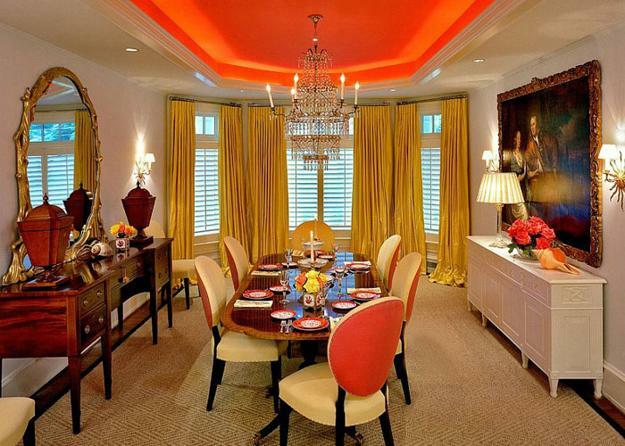 Soft red color shades, sunshine yellow, and all brown colors feel harmonious and pleasant when matching orange decor. Orange brings positive energy into dining room decorating, can spruce up interior design in neutral colors, and harmonize cold palettes. Light and deep orange colors are perfect for fall decorating representing the changing, impressive, and spectacular season. Orange shades are softer that red colors, but optimistic and happy as yellow colors. They work well with reds and yellows and look extraordinary on their own. 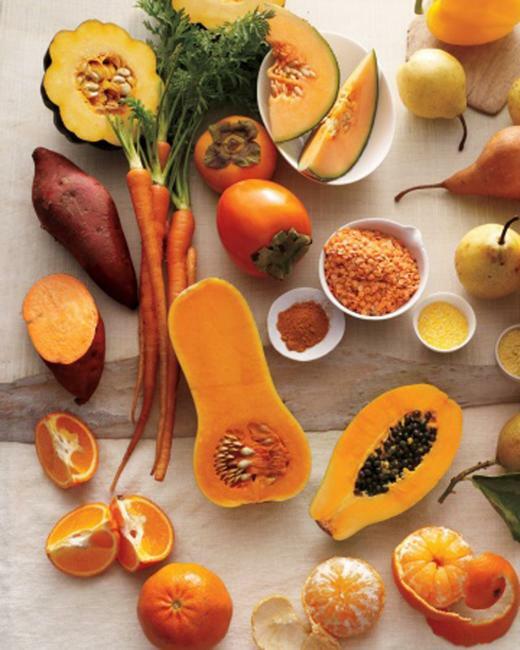 Orange shades find inspirations in juicy fruits and vegetables, oranges, tangerines, carrots, sweet peppers, and melons and conjure up thoughts of vitamin C and good health. 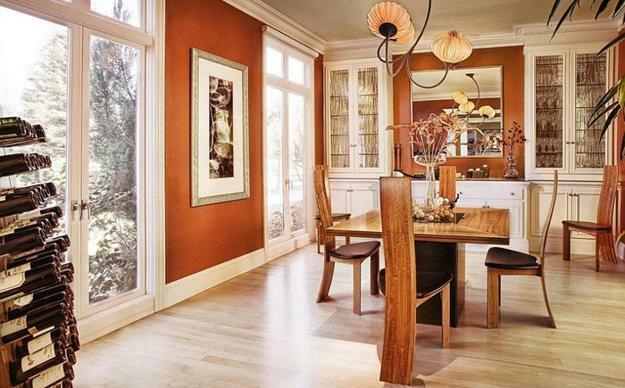 Dynamic, warm, happy and healthy orange hues offer beautiful interior colors for dining room decorating. 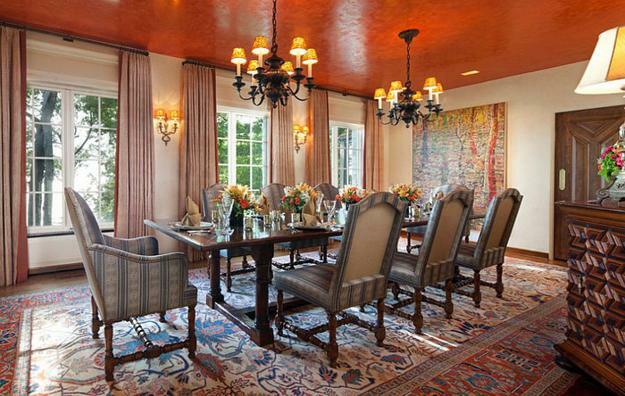 Pumpkin, gold, flame, copper, brass, apricot, peach, citrus, tangerine, vermilion, terra cotta are just a few orange color shades for bringing stimulating energy into dining room decorating. There are many pale, soft, tender shades or bright, spectacular, and dynamic orange colors. All are suitable for modern wall, and ceiling designs or beautiful fall themed decor. Orange is versatile and works well with all soft, cool tones, neutral and warm colors. Beautiful orange color shades with light gray color tones, beige, and white decorating ideas create fresh and elegant dining rooms, harmonious and pleasant.